TripAdvisor added a personalised customer satisfaction management dashboards to each property owner's page on the site. Managers and owners can now instantly assess their performance, as determined by their guests, including trend and competitive analysis, and a new Customer Satisfaction Index. TripAdvisor announced the addition of free, personalized customer satisfaction management dashboards to each property owner’s page on the site. Managers and owners of every one of the 450,000 hotels on TripAdvisor can now instantly assess their performance, as determined by their guests, including trend and competitive analysis, and a new Customer Satisfaction Index (CSI). Market Metrix, a provider in feedback solutions for the hospitality industry, powers these customer metrics. Customer Satisfaction Index - a new scoring system that rates each review from 0-100 based on seven key TripAdvisor ratings, including: overall, value, recommended by traveler, cleanliness, service, room, location. “This partnership will give hoteliers a handle on web generated reviews that they’ve needed. By proactively acting on guest feedback, hoteliers will improve repeat and referral business in this competitive time when market share shifts are inevitable,” according to Robert Honeycutt, CEO Market Metrix. An excellent review of a Tourism Forum held on the Cowal Peninsual in Argyll offers a really good insight into how similar the tourism industry's concernas are across the country. The Tourism Forum took place on 24th September by the Cowalfest team was for the Cowal peninsula but according to the author, "was actually on the money for all of Argyll and the Isles. The facts, the information, the issues and the speakers are germane to everyone in the region." We would argue that the relevance of the report is wider than that and that indeed the agenda and discussions that followed need to be replciated around the country. Problem is the lack of co-ordinated reporting on these events mean that there is little cross learning gleaned by the industry and not enough common solutions found nor implemented. Booking Engines. Are You in Need of Change? What is that old saying? The only two certainties in life are death and taxes. Well there is nothing more certain than change and hasn’t the last year’s economic crisis reinforced that truism? One of the downsides of change however is that all too often it’s done on the spur of the moment and for the sake of change itself rather than strategic thinking or as part of a laid out plan. We’ve had several website clients converse with us over the decision on whether to change booking engines; it’s all too prevalent. A competitive market leads to multiple offers from all sides and the opportunity to change vehicles mid journey without checking the map first! Sure sometimes the mode of transport may not be right but all too often decision are taken in isolation and the change doesn’t identify the root problem; a new vehicle may simply carry you away in the wrong direction more quickly! So if you’re thinking of changing your booking engine supplier you need to rationally go through your tick boxes and make sure it’s not just change for the sake of it and that indeed clear benefits and increased business can be identified. There are no easy growth solutions to your online conversions and under no circumstances have we ever seen a changing of booking engine turn a business around on its own. It requires recognition that online business beds developed like any other part of your business; it requires commitment to taking the time to update, manage and develop your online web presence and pricing. It needs to become an integral part of your thought processes on an ongoing basis. Your website cannot and will not grow on its own. Nor can your direct online bookings. A website that visually does not turn your customer off. It is only when you have stitched all three together are you in a position to analyse whether your booking engine is working well enough for you. If for example you have a three or a five year old website, with old style copy, even, god forbid, out of date content, pictures, promotions and events. If your site is built on technology that doesn’t work with Internet Explorer 7 never mind IE8 or a site that has no Metatags or sitemap or hasn’t been submitted to the Search Engines for years then changing your booking engine will make little or no impact on the neither traffic nor conversion rates through your site. If you’re being asked to change you with an incredible commission offer or sign up promotion be sure that you know how your site traffic is going to be increased. Could it be that this promised new traffic is coming through third party distribution channels? If so that’s a channel distribution issue and not your online booking engine issue. Accommodation providers need to be offering their client with the easiest method of booking online possible DIRECTLY. This is not advocating a ditching of your high performing channels; far from it. The benefits of developing channels in a managed way are critically important for the smaller operator. However it should be part of an online strategy not the driver for an online marketing campaign. Interestingly we note that there is a tendency for some booking engines to offer competitor availability if you don’t have any showing on your own site. This may be great if you’re a group of hotels or even a marketing consortium working closely together with like minded product but to be honest we’ve never seen the business logic of sending someone from your website to a competitor even if you don’t have availability. We would always suggest that accommodation providers think very carefully before losing this site visitor so readily. So if you’re thinking of switching your online provider here’s some food for thought. Determine exactly what it is you need your booking engine to do for you? Is it easy to update availability and rates? Does it need to link to a front desk operation and does the size of your operation justify it? Is it low cost and if so what level of support? Does it include multiple languages and currencies for overseas bookings? Does the booking engine fully integrate into your own website? Will the customer close a new window down if they think it’s a different website? Does it offer competitor rooms if your rooms not available? Are you willing to give your competitor business from your site? Does it feed third party distribution channels? If so at what commission levels? If you’re being promised increased business what are the parameters? Are you going to improve design, content and optimisation? If not how is the site traffic going to grow? These are just a few questions that should be considered when looking at what option suits your accommodation. If you think you may be in need of an online audit email us at The Edge or give us a quick call. Ryanair will no longer accept a driver’s licence as a valid form of identification from October 1. Instead, it is reminding passengers to bring their valid passport or a government issued National Identity card when travelling on all Ryanair flights. It may be worth adding a little note to your website or emails for clients coming to you through Ryanair inbound flights reminding them that they now need a passport for all routes even internal UK. "After nearly 20 years of Kinnaird as a Hotel my family and I have, with regret, decided to close the doors to the public with effect from 30th September 2009." According to press releases it was "Sun and fun" all the way at this year's William Hill Ayr Gold Cup Festival at Ayr Racecourse one of the best in living memory. Crowds exceeded expectations, with more than 21,000 attending over the three days and 12,500 packing the course on Saturday. The release estimated that around £2 million was pumped into the local economy, with hotel rooms within a 15 mile radius sold out and bars, restaurants and taxi firms also benefiting. Regardless of the actual figures the power of events to a local economy cannot be underestimated and Ayrshire is fortunate enough to benefit from an ongoing series of high profile tourism events. The calendar at Ayr has been hit by the economy in line with other corporate hospitality venues but the benefits are still there to be seen to the local hospitality industry. The Open Championship raised the coffers and profile of Ayrshire earlier this year and the development of targeted arts, entertainments and sporting events provides the area with a means to move forward. A co-ordinated effort bringing together the three separate councils is essential in achieving a joint events strategy. Let's not hold our breathe for that one then. How to Feature Good Tripadvisor Reviews! Not quite sure whether the function will be overwhelmingly accepted by TripAdvisor but a clever wee widget is available called Filterstream which will actually filter out any hotel reviews under the grading a hotel specifies! Certainly defeates the purpose of unbiased customer reviews that's for sure but then some still argue that the reviews are far from unbiased in the first instance. Really not sure what the implications are of the widget; strikes me that it must be using a skimming technology similar to that that gets Ryanair and others so up in arms. Could be wrong but just can't see it having approved access to the TripAdvisor database. If it does we'll gladly publish an apology! Anyway the article from HotelMarketing.com states that "FilterStream is a free tool that streams qualified TripAdvisor reviews to a hotel's website. The filter feature ensures only reviews above a certain rating are displayed." "FilterStream searches through TripAdvisor’s database of over twenty million hotel reviews and seamlessly feeds consumer-generated reviews about the hotel to the hotel’s website. As new reviews about a hotel are posted, those reviews are streamed instantly to the hotel’s webpage. The simple widget embed feature makes FilterStream effortless to implement and can easily be customized to conform to the website’s style. FilterStream not only works well with hotels, but is ideal for B&Bs, boutique hotels, resorts, vacation rentals and hotel management companies." Not sure what Facebook think of this sort of filtering and we'll endeavour to find out but I can't honestly imagine that it's what they see as a preferred use of their technology. I guess though it does clearly demonstrate that it doesn't matter how big you are there are alternative uses of your product that you not yet have covered! If you want to have a look at how you can cut out your two and three star reviews give Filterstream a look - it is a clever wee piece of kit! First Images of Trump Development? Well that was the feature article headline anyway. I am not going to reproduce the pictures here - fear of misuse of images not withstanding - as I don't have any way of validating the article. You can however read the article yourselves from the Architects Journal and have a look at the images of the proposed housing and "village green". Make up your own mind! September's been an incredibly busy time so far for Ayrshire tourism marketing company The Edge and the most recent upload is the addition of a website for Management Consultancy firm Blue Spinach. 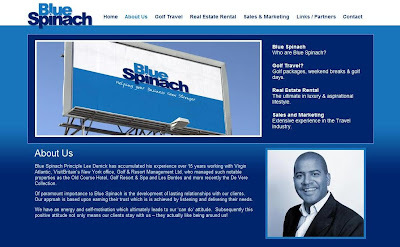 London based Blue Spinach is fronted by Lee Derrick who is well known to many in the tourism industry for his work previously with DeVere Cameron House and The Old Course Hotel. He's gone out on his own now and we were delighted to be asked to develop a website to showcase what he's currently up to. The site is fully content managed and is powered by our own database, The Claymore Project, allowing Lee to update his site whenever he needs to. We wish him all the very best for the ongoing growth of his business. Over the past couple of months we've been working closely with owner Malcolm Simpson and Gill Gallagher on bringing the company's online presence up to date. The project has now passed a few important milestones and some of the results are now starting to come through. The project with Simpsinns is mapped out over a two year period to ensure that we can progressively develop the on-line presence of the group, the individual properties and the profit centres with the properties. In doing this return on investment for the online spend can be better analysed and tracked. The first phase of the project is approaching completion with only secondary navigation to be added for the hotels to give a deeper level of information for the guests and site visitor. At this stage the new websites have been designed to reflect the design work completed by the hotel's own graphic team. At The Edge we've never been precious about working with others; it is essential that positive partnerships are created and collaborations worked upon and when we're provide with the palette of colours and quality of corporate branding as we were from Lynart then it is our job to ensure that the branding remains continuous wherever viewed on-line. Add to this a portfolio of wonderful images to play with we were delighted with what we had to start the project. The result to date therefore is a brand new website for the brand new product; an updated website for the existing product and a new Blog for the joint product. After discussion with Malcolm and his team it was readily decided to provide different websites for each business unit; different styles of operation and location we believe merited different contents and designs. However we decided to keep the layouts and navigations similar to ensure that the visitor going to both sites was able to find their way around easily. Old Loans Inn Website went live a few days after its opening in the middle of July and with the help of an early push with Google Adwords and early submissions to the search engines the site is now performing very well for a start up. The site is driven by our own Claymore Project content management system which means that the team at Simpsinns have full control over their content, images and even metatags and uploads. The image gallery is even automatically updated from their Google Account. The site also features fully integrated booking engine Bookassist and the group function here means that any enquiries not fulfilled by Old Loans are offered availability at Gailes. Complete with Google map and guest reviews Bookassist is already converting site visits to online sales at a highly competitve cost. The Gailes Hotel website benefits from all of the similar functionality to Old Loans and since it's relaunch the increase in online bookings has been very impressive. Having switched over from another system the hotel's conversion rate has increased substantially confirming much of what is a given already and that is that in order for an on-line sales strategy to be successful it needs not just a good looking site with relevant content, nor a world class booking engine nor only good levels of optimisation and site traffic. No it requires a balance of all three; without any one the other two are it could be argues almost worthless in bottom line terms. 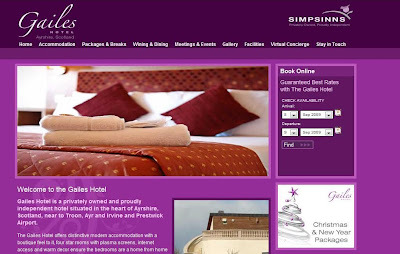 The final stage of phase one was the launch of the Simpsinns blog which is being used to drive up to date news, information offers and even things such as vacancies and guest images. We're really happy with the seamless integration of the off line design into the new sites and look forward over the coming two years to extend the ongoing development yet further. The phase running up to Christmas 2009 will include the launch of the company's YouTube, Twitter and Facebook content. We'll keep you up to speeh with how it's all going. Gailes Hotel, the sister property of The Old Loans Inn in nearby Troon, has just gone live with their new look website. Design company The Edge have been working with the team at Simpsinns in Ayrshire to ensure that the new branding of the Hotel's restaurant supports it's off line marketing materials and reflects areas such as the new Zest Restaurant. The Gailes site makes up just one part of the Simpsinns online campaign - the Old Loans Inn website has been live since the new hotel opened and both sites have retained the same site structure but with very different feels. In addition the hotels have their own Simpsinns Blog which allows up to date articles to be published and images promoted as and when they are taken. This will be supported in Autumn by a co-ordinated Social Media campaign using not only the website but newly designed E-newsletters, their own YouTube Channel and Blog with their Twitter and Facebook camapigns following on from there. As has been widely reported in the press over the past twenty four hours The Forrester Park Golf Resort just outside Dunfermline has announced a £65 million redevelopment proposal for a five-star hotel alongside a dining clubhouse, spa and leisure complex, equestrian centre, driving range and an additional nine-hole golf course. A fishing loch and the obligatory140 new homes will be added, beside a number of holiday lodges. The development is being headed up by the Robert, the son of owners Bobby and Beth Forrester believe it to be the largest private family investment in Scotland for years. Still in the early stages of planning permission, it is thought the new resort could be complete by 2013 offering Michelin star dining and a conference and banqueting centre large enough to accommodate 1000 guests. Was wandering around the east side of Loch Lomond yesterday - Balmaha, Drymen - and the disucssion turned to what should hotels be doing about their online marketing for the forthcoming off season. You know there's a host of complex marketing and promotional strategies likely to be developed but taking the very simplest basic steps will assist a lot of businesses. We like to think that Three Things To Do This Week is a great way of continually improving your busienss performance - and not just in the areas of online marketing. Break it down into simple achievable goals and do them (dare i Say SMART targets). So here's three things to do immediately. Ensure your own website offers the Guaranteed Best Available Rate online - at least matching the Online Travel Agents - and you'll convert more bookings as customers increasingly do their own "Meerkat" comparing! Maximise the number of rooms you offer online. Don't start thinking we're nearly full so it doesn't matter. Those last two rooms online every night for sale to "virtual walk ins" could be a major contribution to the bottom line. Merchandise your rooms. Don't just put them online "En suite Double room, tea and coffee" is hardly inspiring. List what comes with the room. WIFI, rain showers, Egyptian Cotton Sheets, Scottish hand made soaps, private off road car parking, full Scottish breakfast - cooked to order? And bedroom images. Remember you don't always know which button is going to push the client towards that final purchase. Make sure you don't miss the opportunity to merchandise your property. With a new season comes an upgrade to our sponsor website for Kilmarnock FC's Young Supporters the website has a new cleaner and easier to navigate design and includes content management to keep parents and players alike up to date on fixtures and vital travel arrangements. Tourism Matters is not just about good news, it's about questioning what we're doing and how we're doing it and therefore when press releases come in that make your jaw drop they need commented on. Particularly when newspapers all over the world just regurgitate the line without any addition, questioning or understanding. So the headline "Influx of Old Course Bookings" was at first interesting. It went like this. "A rapid influx of tee time applications yesterday (Sep 2) for play at St Andrews Links in 2010 suggests the outlook for Scottish golf tourism next year might be brightening. The Advanced Reservations process for play on the Old Course and The Castle Course opened at 10am BST yesterday and within 15 minutes more than 800 email applications had been received by St Andrews Links Trust. Due to the continued level of demand, the Links Trust, which manages and maintains the seven public golf courses at the Home of Golf, invite applications for tee times a year ahead and at a specific time to try to ensure that everyone has an equal chance to secure a much sought after tee time on the hallowed Links. Despite the difficult economic situation, applications flooded in from around the world to the Trust's Reservations Department. It will spend the next few weeks processing the forms which golfers downloaded from the www.standrews.org.uk website. Alan McGregor, chief executive of the Links Trust, said, "It has been a challenging year for the Scottish golf tourism market so it is particularly pleasing to see that the level of interest in playing at St Andrews Links remains very high. "We are fortunate that so many golfers aspire to play our courses and experience all of the history and tradition at first hand. We work hard to maintain its profile and to communicate to golfers round the world how they can come here to play. The support of our global partner, Allianz, has been extremely beneficial in that regard. "Next year will see the Open Championship return to the Old Course for the 28th time and the spotlight of world golf will once again fall on the Links. We hope this will encourage even more golfers to come to St Andrews to play golf." Now on the surface this sounds like really great news but does it firstly constitute news? The headline really was Old Course Tee Times available for 2010. The 800 emails? Is this up or down? What was the geographic spread? Is there anything that the industry can glean from the pattern. Is there a pick up in US enquiries? Is the money spent recently on golf promotion in emerging Far Eastern markets bringing an upturn? Has Drive it Home(VisitScotland golf promotion) had an impact? Has Homecoming been contributory?What is the seasonal pattern? How does the Old Course closure for The Open affect local tourism operators? How has the Libyan release situation impacted if at all? 800 emails is perhaps great news but the breakdown of the applciations would be great for the industry to start planning on? Anyway hopefully the number of online enquiries is a positive for next year's golf marketplace for The Old Course but we've heard from golf tour operators who don't quite see it in the same light. And not only tour operators but hoteliers and even St Andrews club members and others involved in the industry who have concerns about pricing and distribution channels. There remain grave concerns about some of the strategic partnerships that The Links Trust continue to develop. Of all of the things that you could blog about, the one that is most likely to generate heated responses is The Links Trust and their strategies. The argument is not a new one but it is likely to be one that will be ramped up following next year's event in Wales but it was all the same very interesting to read Irish Caddy Colin Byrne's view of the Centenary course as a Ryder Cup venue. The well respected bag carrier and Irish Times scribe wrote very clearly about the recent way of selecting Ryder Cup venues. "There seems to be a trend that has developed in the past decade concerning the European Ryder Cup hosts; influential businessman, limited knowledge about course design, recognises the game as a great commercial vehicle and wants to fulfil a dream of hosting the most accessible match in professional golf to the masses in his back-yard." For Scotland to choose the Centenary Course at Gleneagles as the arena for the ultimate professional matchplay show-piece speaks volumes for the event itself; integrity and sense of history take a back seat, this is the nouveau golf show open to the highest bidder. The successful Ryder Cup at The K Club was a sodden affair. Even when we have a dry spell The K Club is moist. The Wales Open at Celtic Manor is a murky swamp at best and that’s held in the summer-time. The Johnnie Walker at Gleneagles, played in August, is traditionally a mud bath. It's worth reading the article in full at The Irish Times. All of the above were clearly voiced as I recall by the golf tourism sector in Scotland at the time of the choice of course which again if memory serves me included Carnoustie and Turnberry amongst them. I wonder now what the industry's thoughts on the Ryder Cup venue are? "The overall objective of this project is strengthen and grow the golf tourism offering in Scotland to visiting golfers from overseas and domestic markets. Scotland is already marketed as ‘the home of golf’ but there is an outstanding opportunity to drive golf tourism forward in the next 5-10 years. 4) Budget airlines have routes which mean Scotland is a practical weekend golfing destination for many European players and a weakening pound has made Scotland a more affordable place to visit for American golfers. Golfers have a higher than average spend per trip than other holiday makers, with overseas visitors generally spending three times as much as those from the UK. Golf tourism in Scotland is estimated to be worth £119,000,000 and taking into account the additional knock on benefits to suppliers, it generates around £177,000,000 to the Scottish economy. Scotland has 5 of the 9 venues on the Open rota; however there are many courses just below this top level which do not make the most of their potential. If these courses can fully develop their proposition, then, combined with the current top level courses and the planned resort developments, Scotland would have a truly outstanding golf tourism offer. This 3 year project proposes to target selected ‘second tier’ clubs, i.e. those at a certain level of prestige but just below major championship standard. The overall aim of the programme is to help these clubs understand how effectively they operate, identify areas for potential development, agree an action plan to address these areas and assist with potential solutions. This will result in a measurable improvement in the quality, efficiency, effectiveness and professionalism in management. In turn, this will lead to the clubs ‘raising their game’, attracting more visitors to play at their courses and achieving a measurable improvement in the quality of golf tourism experience and the level of spend." As soon as we have any update on the proposed methodology of the project we'll publish it here. Golf Tourism Scotland, the industry body, have announced that their annual awards dinner will be held this year at Turnberry Resort in Ayrshire on Thursday the 5th of November. Chairman Nick Hunter said, "Preceded by our Annual General Meeting, the awards dinner is always a great opportunity to showcase the best of Scottish golf tourism and to enjoy the company of our colleagues and peers. And, after as challenging a trading year as 2009 has proved to be, I think we all deserve a good night out! More details will be provided soon, but please put the date in your diary for now"
According to research published this week Scotland's hotels performed better than the rest of the UK with a 5.3% rise in occupancy in July, according to the accountants PKF with the rest of the UK seeing a drop of 4% although in Aberdeen the figure fell by 6.1%. Room revenue in Scotland also increased by 8.6% while across the UK it fell by 11.9%. In Glasgow the revenue or room yield rose by 17% which was the highest of any city outside London. Alistair Rae, aat PKF, said it had been a good summer so far for Scottish hotels, "Increases in both occupancy and rooms yield indicate that hoteliers are not having to reduce prices to maintain numbers which is a positive sign that there is a relatively strong demand." The report sounded an already well recognised note of caution saying that there could be problems ahead for the cities if business tourism did not pick up.